Do your eyes burn, sting, or feel scratchy? To remain comfortable, your eyes need to be lubricated, or bathed, with tears. Normally, there is always a film of these ‘basal’ tears on the surface of the eyes. But if your eyes don’t produce enough basal tears, the surface becomes irritated. This is what is known as “dry eye” syndrome. If I have “dry eye” syndrome, why are my eyes always tearing? Dry eye syndrome can cause excessive tearing. So, why wouldn’t those tears just take care of the problem? Simply put, they’re the wrong kind of tears. The tears caused by the irritation of dry eye are ‘reflex’ tears that appear in response to irritating substances, such as onion vapors, or foreign particles. Their job is to wash out these irritants, but these reflex tears lack the lubricating properties of basal tears that are needed to wet and nourish the cornea. What it boils down to is this—crying is NOT the answer. For help with dry eye, see an eye care professional. What causes “dry eye” syndrome? Several types of tear abnormalities can cause dry eye. Eye care professionals can perform tests to assess the quantity and quality of tears before recommending appropriate treatment. Some things that can cause the eyes to become dry include: aging, heating and air-conditioning, wind, smoke, dry weather, allergies, certain medications, eyelid problems, injuries to the eyes, or diseases, such as rheumatoid arthritis. How are “dry eyes” diagnosed? When you see the doctor, be sure to tell him about any medical conditions you have, and any medications you use (especially eyedrops or antihistamines). If you wear contact lenses, you should tell the doctor what kind. The doctor will look into your eyes through a special microscope called a slit lamp. This makes it possible for him to examine the tear film. Your doctor may also use eyedrops that contain a special dye, to help show him any dry spots. 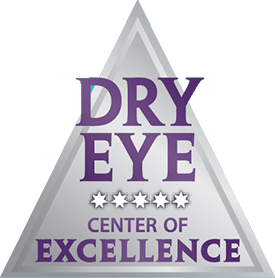 Is dry eye the same as ocular surface disease? Ocular surface disease can be broadly defined as a group of disorders that affect various parts of the eye’s surface. Dry eye is among these disorders and is one of the most common. To remain comfortable, your eyes need to be lubricated, or bathed, with tears. Normally, there is always a film of these ‘basal’ tears on the surface of the eyes. But if your eyes don’t produce enough basal tears, the surface becomes irritated. This is what is known as “dry eye” syndrome. Other disorders related to ocular surface disease, such as inflammation and allergies, also result in tear film dysfunction or damages to the eye’s surface. Symptoms and signs of the disorders contributing to ocular surface disease may include eye discomfort, burning, fatigue, fluctuating visual acuity, infection, ulceration, scarring of the eye’s surface, and possible loss of vision. What causes ocular surface disease? Several types of tear abnormalities, such as poor tear quality, can cause ocular surface disease. Other possible causes could be aging, heating and air-conditioning, wind, smoke, dry weather, allergies, certain medications, eyelid problems, injuries to the eyes, or diseases, such as rheumatoid arthritis. By providing diagnostic tests for all of these, our doctors determine whether you are suffering from dry eye specifically or another ocular surface condition. They then identify and lead you down the right treatment path for you. How are ocular surface diseases diagnosed? It can be easy to overlook signs of ocular surface disease during an examination unless you’re specifically looking for it. 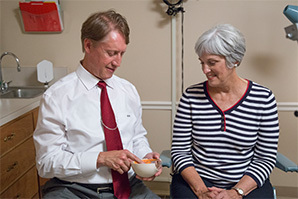 When you visit Dr. Black’s Eye Associates, you’ll be given a short questionnaire to determine whether you may benefit from a quick ocular surface evaluation. If so, the doctor will look into your eyes through a special microscope called a slit lamp. This makes it possible to examine the tear film. Your doctor may also use eyedrops that contain a special dye to help show any dry spots. A separate test to measure your tear production may also help determine whether you are in need of ocular surface treatment. 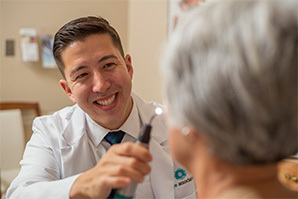 If these tests suggest ocular surface disease is present, your doctor may recommend a treatment path customized to correct your unique condition. Note: Be sure to tell your doctor about any medical conditions you have, and any medications you use (especially eyedrops or antihistamines). If you wear contact lenses, you should tell the doctor what kind. 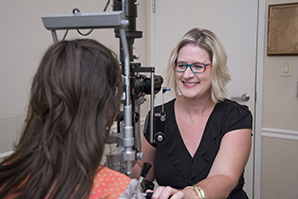 Take the Dry Eye Quiz to find out if you may benefit from scheduling an eye evaluation at Dr. Black’s Eye Associates’ Dry Eye Center. Learn how ocular surface disease is diagnosed and treated. 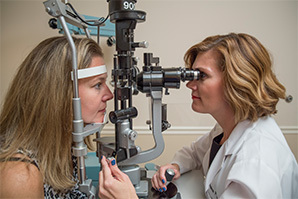 Learn how to prepare for your eye exam.